ASSA ABLOY Entrance Systems arbetar med automatiska entrélösningar. Energibesparabde lastbrygga med teleskopisk läpp konstruerad för kylanläggningar. Levereras färdigmonterad och installationsfärdig. Enheten lyfts in i förberedda platsen. Uppblåsbar vädertätning för tätning mellan portöppning, lastfordon o.d. Snabbrullport med nödutgångsfunktion. Medelstora öppningar. Kan utrustas med fönster. 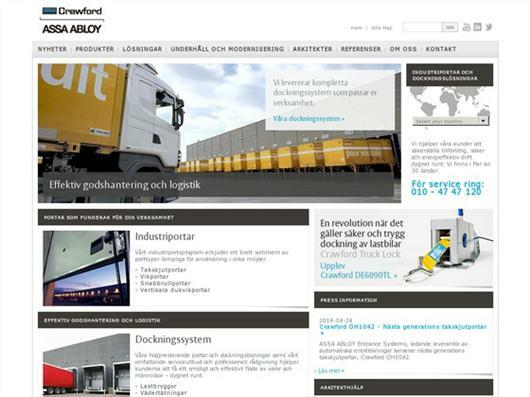 Nordic SW är vertikalgående takskjutportar med portbladssektioner av PUR-isolerad stålplåt, avsedda för industribruk. Manuell eller maskinell manövrering. SLW industriport med stålsektionssockel och aluminiumramkonstruktion, dubbla PUR-isolerade väggar samt glasning med dubbla rutor för optimal värmeisolering. Vertikal dukvikport för medelstora öppningar. Upp till 8 m bredd, 12 m höjd. The Crawford VL3010 vertical lifting fabric door from ASSA ABLOY Entrance Systems is a system of doors for industry that has been specifically designed to cope with specifications for durability, tightness, reliability and minimum maintenance requirements of Heavy Industry, Steel Mills, Waste & Recycling and any application in tough environments and high winds. Crawford VL3016 from ASSA ABLOY Entrance Systems is available in an extra corrosion-proof model for extremely corrosive environments. The door may be mounted on the inside or outside of a building, or in the actual door opening. Crawford VL3016 is available for delivery with optional side jambs if the existing mounting surface is not suitable for the side guides. The machine box and motor can be enclosed in various ways. The Crawford VL3110FCS vertical lifting fabric door from ASSA ABLOY Entrance Systems delivers rapid performance in tough industrial environments. It’s an ideal choice for speed, but also for protection against wind, moisture and more. The unique design and structure offers durability, tightness, energy efficiency, operational reliability and minimum maintenance. Every door is individually designed to meet application requirements, for example high wind load. Crawford VL3110 is the door model for medium-sized openings, up to 8m width / 12m height, in industrial environments where doors are exposed to moisture, cold, heavy wind loads or dust. For extremely severe environments, Crawford VL3110 is available in an extra corrosion-proof version. To cope with openings exposed to intense traffic, Crawford VL3110 is available in a high-speed version. Crawford VL3110 can easily be mounted internally or externally on the building. To simplify adjustment to the building, there is a self-supporting design available. Crawford VL3110 is available for delivery with optional side jambs if the existing mounting surface is not suitable for the side guides. The header box may be protected with various cladding options. Crawford VL3116 vertical-lifting fabric door is designed for large openings, high wind loads and harsh conditions. The unique design and structure are well-proven in marine environments and offer high reliability and require minimum maintenance. Every door is individually designed to meet your application requirements. The Megadoor VL3190 vertical lifting fabric door is the preferred door model for the extremely large door openings needed for aircraft hangars and shipyard halls, it serves equally well in any door application where innovative design will make a positive difference to the construction cost and subsequent operating efficiency. The Crawford DL6010S Swingdock from ASSA ABLOY Entrance Systems is the standard solution in general industry applications which is easy to operate. The swing lip of the Crawford DL6010S Swingdock safely bridges the gap between the ramp and the vehicle bed. The Crawford 6020T Teledock from ASSA ABLOY Entrance Systems, i.e. the dock leveller with a telescopic lip, is the universal and most flexible docking system. It is suitable for every loading situation - regardless if its complexity. The main advantage compared to other levellers is the movable telescopic lip which can be precisely positioned on the vehicle bed, thus giving optimal load utilisation of the whole vehicle bed area. The Crawford 6020TA Teledock Autodock from ASSA ABLOY Entrance Systems has a telescopic lip and self supporting frame for easy integration with a building. The Crawford 6020TA Teledock Autodock provides a larger contact area between vehicle bed and dock leveller for optimal and safe positioning on the vehicle bed. The aluminium lip is extremely flat resulting in smoother passages between leveller and truck bed. It is ergonomic as well as economical. The Crawford 6020TI Teledock Isodock from ASSA ABLOY Entrance Systems has a special telescopic lip dock leveller who brings energy savings for cold storage. Unlike conventional docking systems, the Crawford DL6020TI Teledock Isodock leveller is placed behind a well insulated sectional door. It is also hermetically sealed off from below, preventing cold or hot air access. The Crawford 6020STA Stepdock Autodock from ASSA ABLOY Entrance Systems is a dock leveller that provides increased efficiency and safety for the docking process. The leveller is specifically developed to let a truck dock to the loading bay with closed rear doors. First the truck is put in the right position and then preferably an inflatable dock shelter seals off the loading bay before the sectional door is opened. The last step of the complete dock-in procedure is that the rear doors of the truck are opened. This sequence “dock first – open the rear doors later” provides a number of benefits: saving of energy, improving working conditions in particular for the truck driver, increasing safety of people / goods, and improving the efficiency of the docking process. The electro-hydraulic Crawford 6030C Combidock from ASSA ABLOY Entrance Systems eliminates the need for different ramp heights and thereby reduces building costs. It is advisable to equip every frequent loading area with at least one Crawford 6030C Combidock so that vehicles of all sizes can he efficiently handled. The telescopic lip is supplied in high-stability aluminium alloy which extremely flat, resulting in smoother passages between leveller and truck bed – giving ergonomic as well as economical advantages due to reduced chock oads for people and less wear and tear on the handling equipment. The Crawford DS6060A curtain dock shelter aluminium from ASSA ABLOY Entrance Systems is a curtain dock shelter which is the standard solution for energy saving oriented operators. It is equipped with a weight reducing aluminium frame. The vehicle reverses into the Crawford DS6060A curtain shelter which seals it off with flexible side and top curtains, giving weather protection during the loading and unloading process. The Crawford DS6060P curtain dock shelter parallel from ASSA ABLOY Entrance Systems is a curtain dock shelter which is available in a large variety of heights and widths. This model includes a self-adjusting top section which automatically adapts to different vehicle heights and vertical movements. The vehicle reverses into Crawford DS6060P curtain shelter which seals it off with flexible side and top curtains, giving weather protection during the loading and unloading process. The Crawford DS6070B inflatable dock shelter bags from ASSA ABLOY Entrance Systems is a inflatable shelter which is inflated around the docked vehicle, providing complete sealing. The inflatable shelters are suitable for a wide range of vehicle sizes and their sealing capacity exceeds by far the standard normally required by operators. The top seal of the Crawford DS6070R inflatable dock shelter rollo from ASSA ABLOY Entrance Systems is a roller design – automatically activated for low or high vehicles. In addition, it follows all vertical movements of the docked vehicle, continuously providing high tightness. In rest position, the Crawford DS6070R is completely retracted behind the side structures, giving the vehicle driver the possibility to use the complete width of the loading bay when reversing into it. In addition, yellow front line indicators further facilitate the dock-in navigation. Stable collision protectors at the ramp height prevent shelter damages. The Crawford LH6080L heavy duty stand alone loadhouse from ASSA ABLOY Entrance Systems is the heavy duty version of the of load houses, especially developed to meet all requirements of architects, builders and operators. It is suitable for all geographical areas with snow load up to 2,0 kN/m² and our static calculations are certified by a third party. The Crawford LH6080 is the safe and reliable choice including ideal support for the construction planning and building permission process. The Crawford LH6081L light version stand alone loadhouse from ASSA ABLOY Entrance Systems is the light version of the new generation of load houses, especially developed to meet all requirements of architects, builders and operators. It is suitable for all geographical areas with snow load up to 0,89 kN/m2 and our static calculations are certified by a third party. The Crawford LH6081L is the safe and reliable choice including ideal support for the construction planning and building permission process. The Crawford HS9030G from ASSA ABLOY Entrance Systems is designed for interior applications where sealing, aesthetics and space-limitations are important. With its modern design, the Crawford HS9030G is most space-efficient model available in the market. The Crawford HS8010P from ASSA ABLOY Entrance Systems is designed for exterior openings in heavy-duty operations. It protects your environment against drafts, humidity, dust and dirt. With fast opening and closing speed, the door improves your traffic flow, provides employee comfort, and saves energy. The Crawford HS8010PL from ASSA ABLOY Entrance Systems is designed for exterior openings in large-sized heavy-duty operations. It protects your environment against drafts, humidity, dust and dirt. With fast opening and closing speed, the door improves your traffic flow, provides employee comfort, and saves energy. The Crawford HS8110P from ASSA ABLOY Entrance Systems is an evolution of the Crawford HS8010P. It is designed for increased longevity and comfort in medium-sized heavy-duty operations. It protects your environment against drafts, humidity, dust and dirt. The Crawford HS9010P from ASSA ABLOY Entrance Systems is designed for interior use in medium-sized heavy-duty operations. It protects your environment against drafts, humidity, dust and dirt. With fast opening and closing speed, the door improves your traffic flow, provides employee comfort, and saves energy. The Crawford HS9020G from ASSA ABLOY Entrance Systems is designed for interior applications. It offers perfect sealing thanks to a unique design. It requires very little space and protects your environment against drafts, humidity, dust and dirt. The operating speed combined with its sealing properties improves your traffic flow, provides employee comfort, and saves energy. The Crawford FD2050F folding door from ASSA ABLOY Entrance Systems is one of the most stable folding doors on the market. 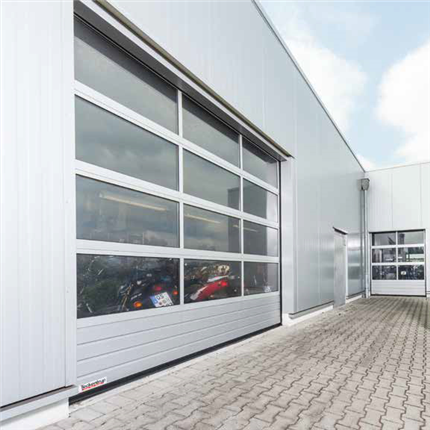 The Crawford FD2050F folding door is suitable for use in premises with high daylight admission demands, or buildings used for product exposure such as showrooms. The highly adaptable design makes it possible to install this door in almost every type of building. The door slides (folds) to the left, right, or in both directions if it is in two parts. The Crawford FD2050FCW folding carwash door from ASSA ABLOY Entrance Systems is one of the most stable folding doors specifically designed to cope with the harsh and humid environment in car wash halls or similar applications. The door is made of anodised aluminium tubular profiles with special anti-corrosive features. It is filled with aluminium infills or glass windows. The anti-corrosive features and high light admission makes this door the ideal choice for car wash environments that require maximum lighting. Crawford FD2150P from ASSA ABLOY Entrance Systems is designed to be a strong, stable and robust folding door. It delivers a unique mix of safety, reliability, ease of opening and optimal space-saving. This smart sideways folding door is so easy to open, even after long periods. Crawford FD2150P is the perfect choice for the unique needs of the farming, construction, industrial and automotive industries. The Crawford FD2050P folding door from ASSA ABLOY Entrance Systems is one of the most stable folding doors on the market. 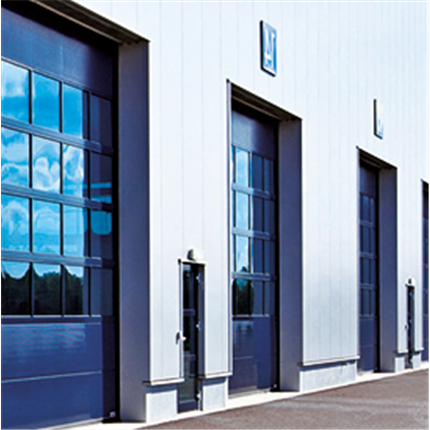 It is a well insulated folding door especially developed for demanding industrial environments. High flexibility makes it possible to install this door in almost every type of building. The door slides (folds) to the left, right, or in both directions if it is in two parts, leaving the door opening completely free. The Crawford FD2050P folding door has been designed to meet all operational and safety requirements in the European Directives and the standards issued by the European Standardization Committee, CEN. Modern, robust and flexible, the new Crawford OH1042P from ASSA ABLOY Entrance Systems is designed to keep your business moving – for all duties and in all weathers. Each part of the Crawford OH1042P overhead sectional door is built to the highest standards. The combination of wind-resistant reinforced panels and a class 3 certification for water tightness, wind load and air permeability give you a door that looks better and performs longer. Small innovations that make a big difference to the buildings they protect. Modern, robust and flexible, the new Crawford OH1042F from ASSA ABLOY Entrance Systems is designed to keep your business moving – for all duties and in all weathers. Filled with innovation, and superbly well insulated, this rugged, attractive overhead sectional door gives you the highest number of options at the lowest possible running cost. It’s the perfect choice for warehouses, logistics centers and all kinds of business premises.